March 18, 2019 | Sidney Madden -- In astrology, your Saturn return is the time in life when Saturn goes back to the same spot it was at the time of your birth. As Nao explained during her appearance at NPR's Tiny Desk, "It's about leaving adolescence and going into adulthood." This crossing of the threshold that happens around your late 20s to early 30s is the inspiration for Saturn, Nao's sophomore effort and one of 2018's best albums. 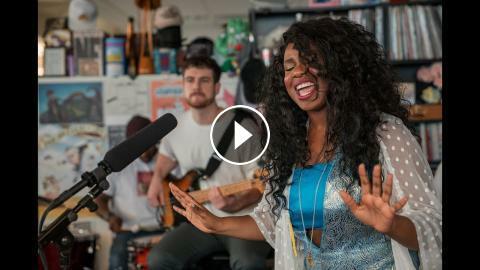 When the U.K. singer-songwriter brought her band and cosmic energy to the Tiny Desk — sneaking in her 2015 breakthrough track, "Bad Blood," alongside Saturn standouts — the strength and conviction of her performance had fans in the office strapped in for the emotional ride.